I’m not taking a chance…not because she’s black but because we use the word n—er sometimes here. I’m not going to take any chance ever in life of losing everything I’ve worked for 30 years because some drunken n—er heard us say n—er and turned us into the Enquirer magazine…I’m not taking that chance at all never in life. Never..
On his show, Duane comes across as a tough guy with a soft heart. After tracking down lawbreakers and bail-jumpers, he’s always ready with a hug or a kind word of advice. Of course, it’s nothing new for the people/characters on reality shows to be very different from their on-camera persona, but Chapman’s rant still stands out for its defiant racism. In the end, more disappointing than one reality star’s private racism is the response of many people. In the email talkback segment of one cable news show, viewers’ opinions ranged from “get over it” to outrage that anyone was offended by this incident at all. Is there more resentment brewing underneath the surface, or are people just more willing to express it? 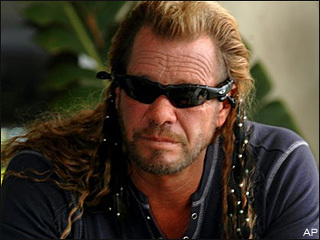 Well, in any case, we can probably expect to see Dog back on the hunt in a month or two — just ask Don Imus.